How many times have you just thrown away things that you no longer needed? Disposing stuff that we no longer need has been a human practice for quite some time now. We come across slogans about how waste items are being dumped in large water bodies, which leads to a lot of water pollution and disturb aquatic life; but seldom do our bit to reduce the ill-effects. My favorite part of making best out of waste is the quality time spent while making something or just spending some time with the lesser fortunate people. Here are 3 cool tips that you can follow to do your bit to make the best out of waste. Do you have clothes that don’t fit you anymore, or are a bit worn out? Donate them. There are many poor and homeless people who are in need of these clothes. In poor countries, especially like India, there are many poor homeless people who cannot even afford two square meals a day, let alone basic clothes. While I do not suggest that you donate money (which you should, if you feel like), you can certainly donate your old clothes that you won’t be wearing anymore. Nothing is more precious than the look on that little kid’s face when he tries on some new clothes. Some great websites that offers an online solution are - PickUpPlease (for US), Goonj (for India) and ClothesAid (for UK). There are tons of things that end up in your garbage bin after you use them. One such category is plastic cola bottles. 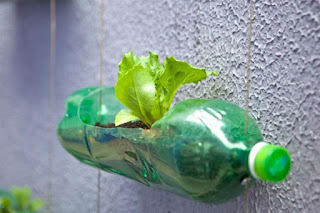 Big or small, remove the labels, cut a rectangular hole, put some wet soil in the bottle through the hole (with the cap of the bottle still on it) or just chop the top off and plant some saplings. It looks great and can even used for some backyard farming. Another cool idea is making your own personalized fridge magnets. It’s really simple and all it requires is crowns from beer bottles, glue and adhesive magnets (Buy adhesive magnets, USA readers here or UK readers, over here). Flatten the crowns by beating them with a hammer. Next, take stamp sized pictures that you want to personalize and glue them to the inside of the crown (the side which is inside the bottle when the crown is in place). On the reverse, stick the small magnetic disk and you’re done! Pen Stand from ice cream sticks. Magazine Holder from a cereal box. If the disposable items are in decent condition, but no longer serve your purpose, you can easily sell them off on eBay (Australia, Austria, Belgium, Canada, China, France, Germany, Hong Kong, India, Ireland, Korea, Malaysia, Netherlands, New Zealand, Philippines, Poland, Singapore, Spain, Switzerland, Thailand, UK, USA and Vietnam), Amazon (US customers and sellers click here. For UK counterparts, click here), OLX (India specific) or Craigslist. It’s a great way to make a little cash and get rid of the old stuff at the same time. However, be careful while buying or selling things online. There are plenty of thugs who are into fake deals. These tips will surely make you feel good, resourceful and/or richer. So go out and do the needful to help reduce waste. I always love listening to you so let me know whatever you think about recycling, reusing and stopping solid waste from polluting our environment. You can join this awesome community on Google+ for taking a right step towards a better tomorrow. If you like what you read, don’t forget to subscribe for more amazing articles. How do you attach the bottle to the wall?